We love family movie nights. 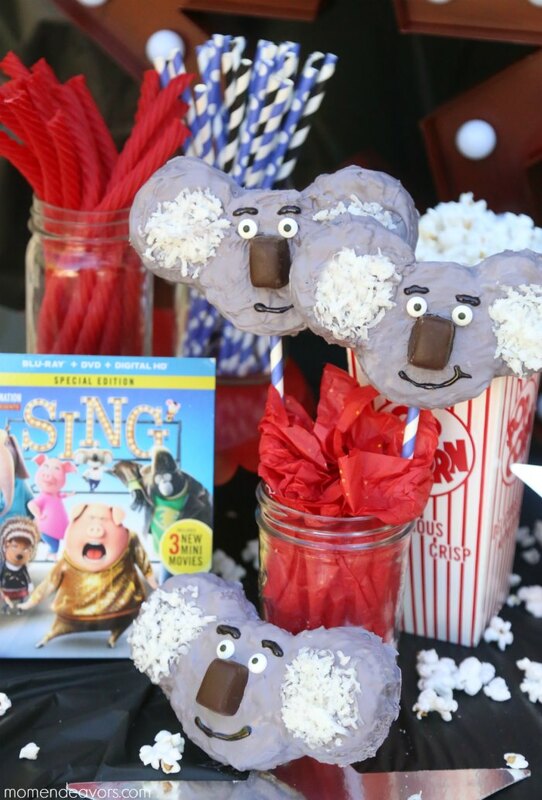 So, we are thrilled to partner with Universal Pictures Home Entertainment to celebrate the Blu-ray and DVD release of SING with some Buster Moon Koala Krispy Treats and special movie night fun! 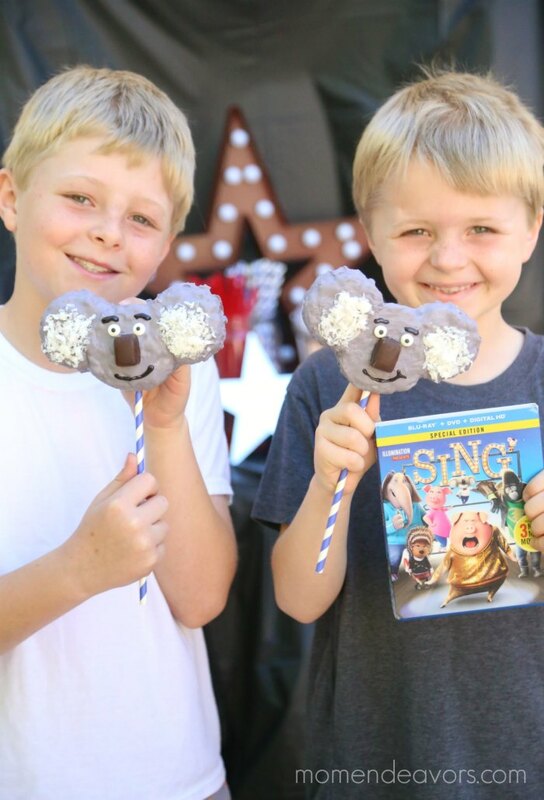 We saw SING in theaters, so the kids were thrilled to find out that it is now available to own on Blu-ray and DVD! The movie was heartwarming and funny with great music and a fantastic cast! 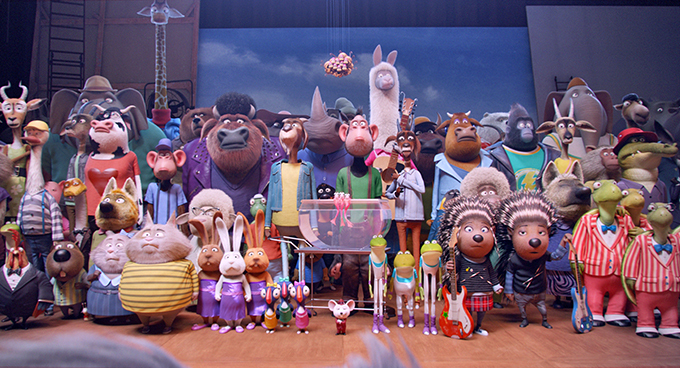 In fact, SING was the Golden Globe nominee for Best Animated Feature and Best Original Song, It features more than 65 hit songs including ‘Faith,’ a brand new song by the legendary Stevie Wonder (featuring Ariana Grande), marking his first song for a major film release in 25 years! We LOVE the music in this movie!! Start by cutting your krispy treats using the different circle cutters. Use the larger one for Buster’s face and two of the smaller ones for ears. Use the large cutter to cut a small crescent shape out of each ear (to make it easier to attach to the face). Then, make the gray coating for the treats. 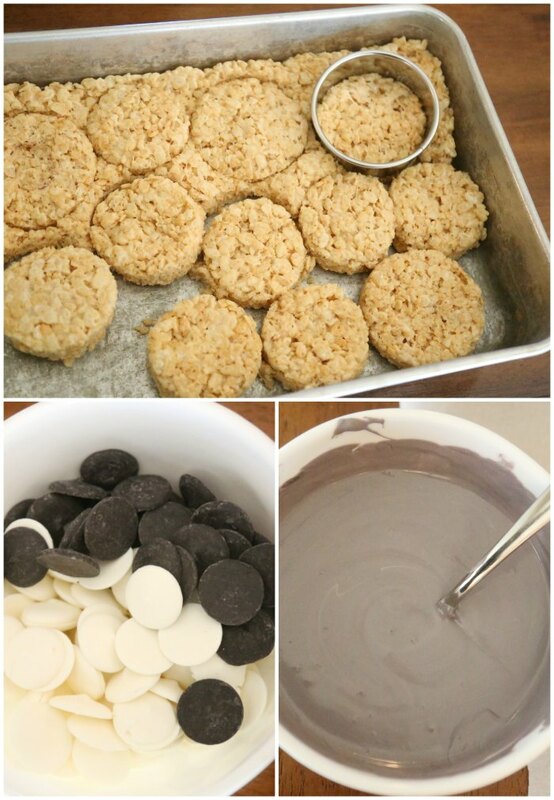 Combine black and white candy melts (using more white than black) to get the desired gray color. Melt according to package directions. Dip the “face” and the two “ears” in the melted candy coating. Make sure they are coated well enough that the cereal doesn’t show through. Stick the ears to the side of the face (push hard enough that they really stick together). 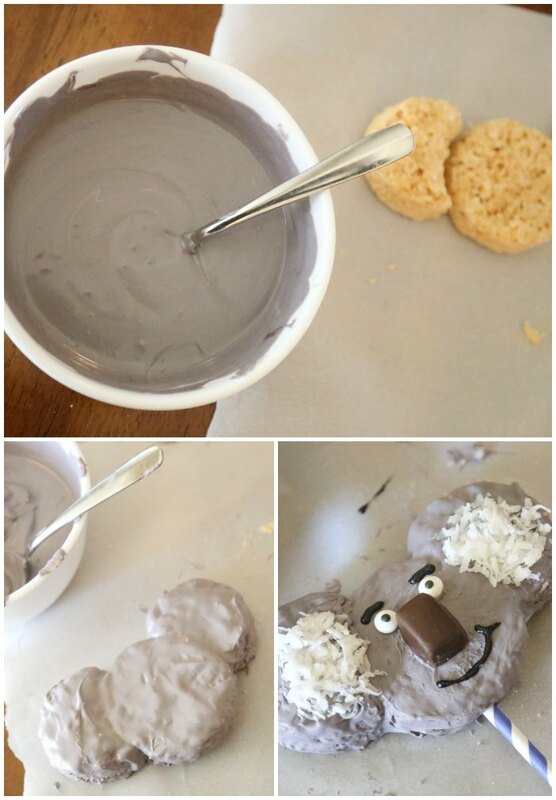 Then, before the candy coating hardens, add on the dark chocolate nose, the candy eyes, and the coconut for the inside of the koala ears. Place in the refrigerator to harden to candy coating (*Note: If you want them to be krispy treat pops, slide a paper straw or lollipop stick into the treats before placing in the fridge). Then, draw on the eyebrows and mouth with the black frosting writer or an edible food marker. Repeat steps for each koala treat. 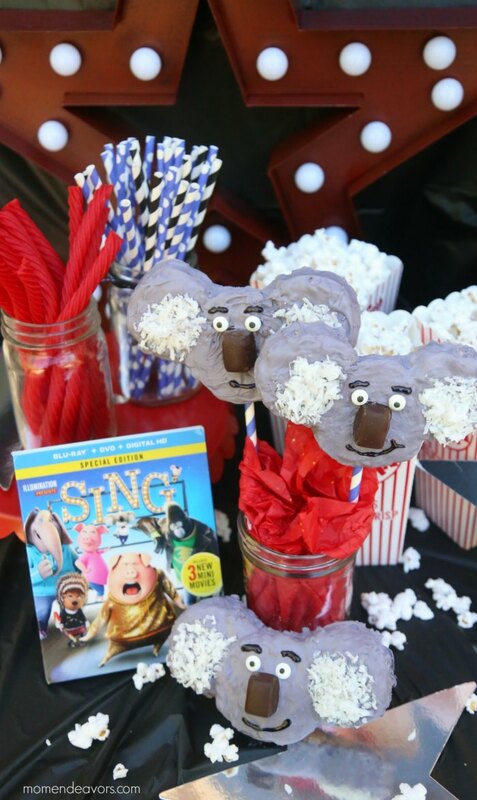 All that’s left to do is to add your koala treats to a little movie night party set up and ENJOY! We just put together a fun little “concessions stand”, complete with star decor, popcorn, licorice, fun straws for drinks, and our Buster Moon koala treats! The boys couldn’t wait to dive in with their treats and enjoy some fun (& tasty) family movie time! 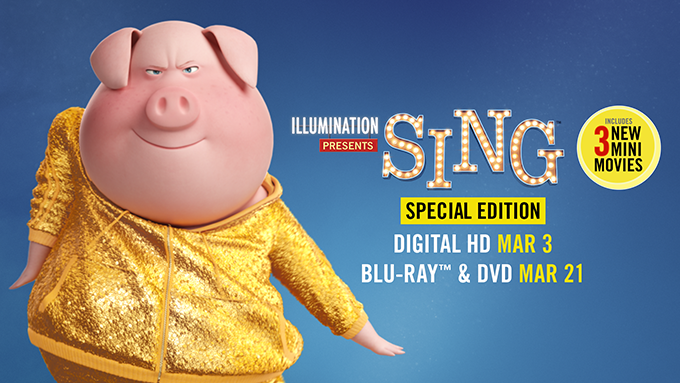 So, pick up a copy of SING Special Edition on Blu-ray in stores for your next family movie night! It’s so good! In addition to the movie, there are over 60-minutes of bonus content and three all-new entertaining mini movies featuring the cast from SING as well as an exclusive Tori Kelly music video and a variety of musical extras. In the meantime, watch the trailer below! Your family is sure to love it! Disclosure: This post is part of a sponsored campaign with Universal Pictures Home Entertainment. All opinions & movie night ideas are my entirely own. These are just so cute. Looks just like the character in the movie.